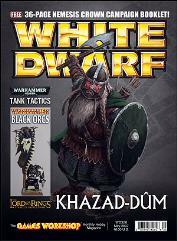 #328 "Khazad-Dum, Tank Tactics, Black Orcs"
Dwarves, Dwarves, Dragons, and more Dwarves. We look at the new miniatures for Khazad-Dûm. The Balrog is awake, and it’s angry. Scores of Dwarves take on the servants of Evil as they try to save their king. Jervis ponders the coming worldwide campaign. Wipe the smile off your opponent’s face by driving a house-sized armored vehicle into his army. Prepare your models for the upcoming painting competitions with a few of these tricks. This scenario, the first of a four-part series, explains the terms of the premier U.S. Nemesis Crown mega battle.